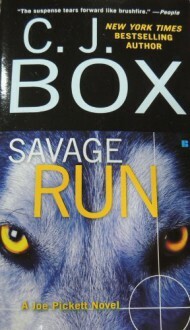 In Savage Run—C.J. Box's acclaimed follow-up to his career-making debut Open Season—game warden Joe Pickett looks into the bizarre death of an environmental activist...and what he finds is bigger and far more sinister than anything he imagined. I enjoy this series, although it hasn't made it into my favorites list yet. The plot dragged a bit at times, and the ending was frustrating and a bit unsatisfying. I really like the main character, and will read more.